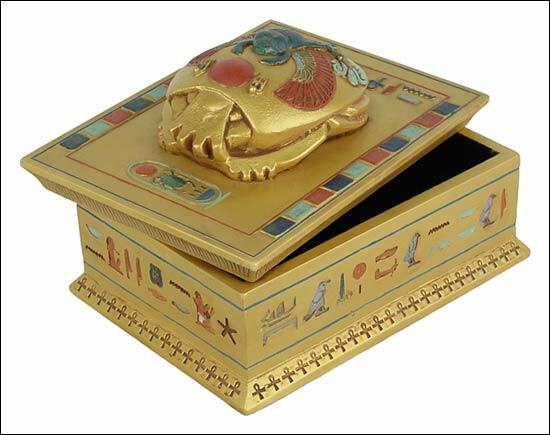 Scarab box, scarab, Egyptian scarab. The scarab was associated very early on in Egypt with the generative forces of the rising sun and with the concepts of eternal renewal. The beetle is known for coming out of the sand backwards dragging its ball of dung behind it along the ground before depositing it in underground tunnels as a source of food for its larvae, therefore symbolizing the sun�s daily journey across the heavens from East to West. Because the young beetles seemed to emerge spontaneously from these tunnels, the Egyptians worshipped the scarab under the name Khepri: �He who came forth from the earth� or �He who came into being�. Thus the beetle was equated with the creator Got Atum from early times. Scarabs thus became potent amulets and were often placed upon the breasts of mummies in the position of the heart as a symbol of new life and were then weighed against the feather of truth in the final judgment. They were usually inscribed with part of chapter 30 of the Book of the Dead.